Our historic 1887 Chapel sits beside our current sanctuary. Worship is a public act. All who love God and seek to grow as disciples of Jesus Christ are welcome to participate in any of our services. In the tradition of the United Methodist Church, membership in this nor any other United Methodist Church is not required to partake of the Sacraments or participate in our programs and activities. Historically, membership in the United Methodist Church has always been open to anyone who "has a heart for God". We are, of course, a Christian church and accept the Apostle's Creed and the Nicene Creed as the historic definitions of the Christian faith. Discernment of God's will for each of us comes through study of the scripture, interpretation through the tradition preserved and transmitted by the Holy Spirit, our own experience of the Holy Spirit within each of our lives, and the guidance of reason, both within our own mind and in the guidance of the great cloud of Christian witnesses that surround us in the community of faith. The specific obligations of membership in any United Methodist Church are support of the church, its mission, its members, and its ministry through our prayers, our presence, our gifts, our service, and our witness. 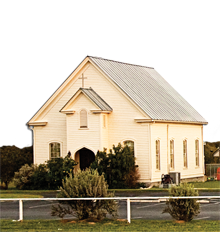 If you have any questions on membership at La Vernia UMC, please contact the pastor.